Nationals Park is making some changes ahead of this year's season. There will be new vendors, new foods and even a new brand of alcohol served in the park, but there will also be some rule changes this year. Find out what's new in 2019. The giveaway at Nationals Park for next Monday’s exhibition game will be a curly-W drawstring bag that fans might need later — a ban on backpacks is included in the list of what’s new at the park this season. Fans with bags larger than 16″ by 16″ by 8″ have the option of putting them in lockers that will be positioned outside the park on First Street Southeast and at the south entrance along Potomac Avenue Southeast. The cost is $2 an hour for a smaller locker and $3 for a family-sized locker that can fit more than one bag. Prices max out at $10 and $15. Another new part of the fan experience is being able to pay seat-side vendors electronically. More than half of the so-called “hawkers” selling everything from beer to peanuts and cotton candy will accept Apple Pay, Google Pay or credit cards in addition to cash. Another way to help keep fans in their seats to enjoy the game (instead of standing in concession lines) includes the use of the app Caviar. It’s specifically geo-fenced for the ballpark with concession availability at section 106 that will rotate food themes periodically. Here’s how it works: The featured menu will pop up, you order, you get an alert when the food is ready, and then you go to the concession stand to pick up your food. Traditional walk-up ordering and payment also is available. The first featured restaurant will be Tiger Fork. For fans who believe Ryan Zimmerman truly is a superhero, the infielder will be honored with a Captain America-themed bobblehead available to the first 10,000 fans attending Marvel Superhero Day on May 25. Find all the theme nights, kids events, apparel, bobbleheads, giveaways and fireworks schedules here. The team’s racing president is the new virtual assistant for the Nationals’ MLB.com Ballpark app. 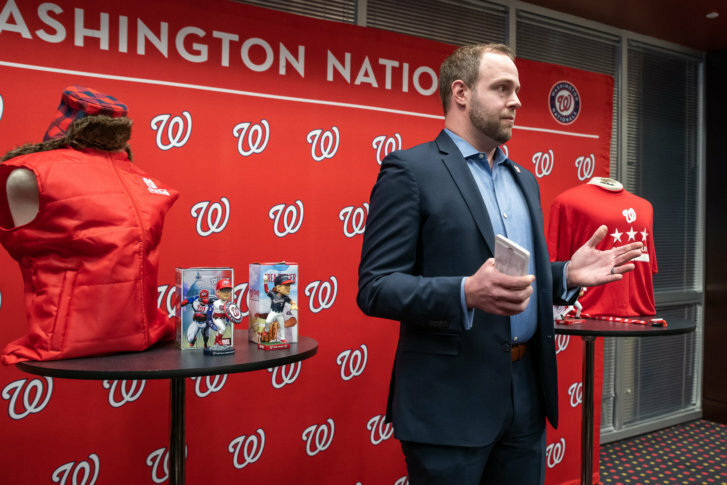 Teddy can help fans find their seating sections, the closest bathroom, whether the team store has Zimmerman jerseys in stock or what time the “kids-run-the-bases” event starts after Sunday’s game. The app also lets you search for food based on where you are and what’s nearby or whatever you might be craving. The first female-owned distillery in D.C. history will enjoy the notable distinction of vodka exclusivity at Nats Park. Civic Vodka by Republic Restoratives will be the featured vodka at all ballpark bars and the only vodka for purchase in general admission areas of the park. Every hot dog on the property will be a Hebrew National. Want to show your school pride? Fourteen colleges will now be featured at the park. Fans who purchase special tickets can gather to enjoy pregame festivities dedicated to their schools and get a co-branded baseball hat.